Hold on to your hats, my exciting Washington DC play-by-play continues with our Saturday adventure to Mount Vernon. If you have a moment while you enjoy a cup of coffee or clip your toenails, you can read more of our adventures here, and here. 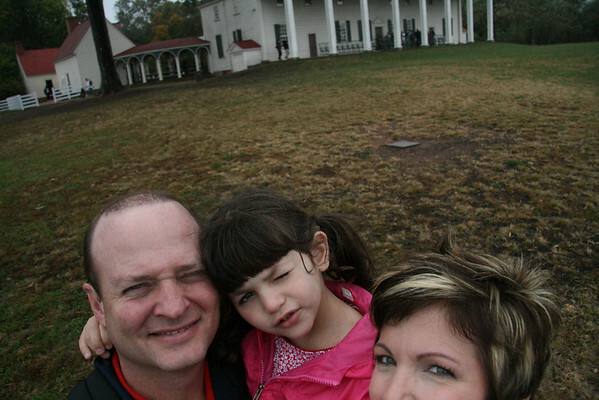 Since we were staying in Alexandria, Virginia, George Washington's home was only 9 miles away. I would have regretted being so close and not going, so of course we did. It was so worth the exorbitant taxi fare. Really. 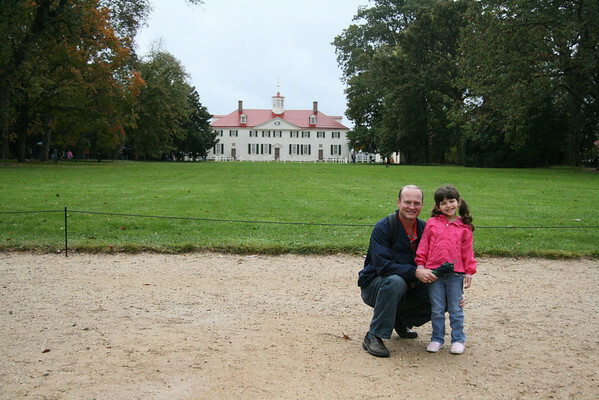 Having been a chaperone several times for our school's 5th grade trip to DC, I had visited Mount Vernon before and had left each time still not knowing much about our first president. Over the last few years the Mount Vernon Ladies' Association has made some amazing improvements. Seriously. There is now a Visitor's Center with exhibits and they offer an introductory film about the American Revolution and George Washington's pivotal role in it. Parts were a bit frightening for Annelise (the blue faced Indians and the battle scenes--a horse was shot, people were too, but the horse...), still it provided an interesting overview. We toured the grounds and the house next. Absolutely gorgeous. This was a beautiful time of year to visit. The colorful trees, fallen leaves all over the ground and cooler weather. We tried to capture a self-portrait without much success. Yeah, so NOT our Christmas card. 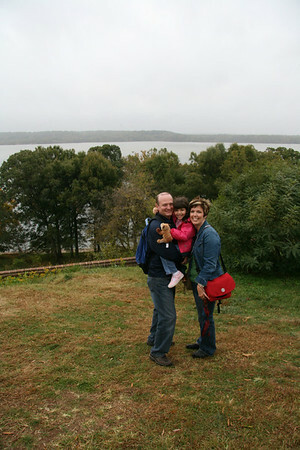 A kind gentleman also took our photo in front of the Potomac. Still not our Christmas card. As it started to drizzle, we made our way to the new museum. 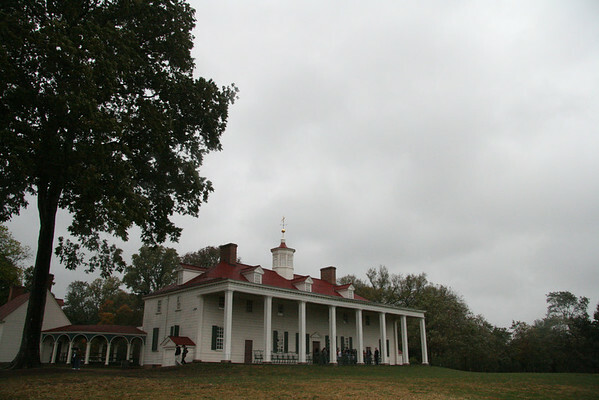 It was built underground as not to interfere with the original appearance of Mount Vernon. The museum is a WONDERFUL overview of George Washington's life, his military career, his presidency, his love of farming and his greatest contributions to America. 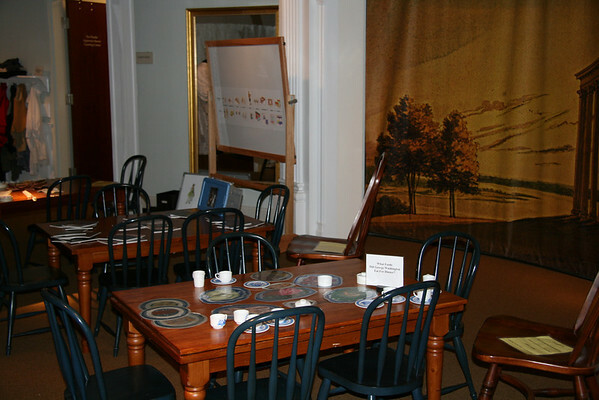 The museum is interactive with plenty of buttons, life-like exhibits, maps, hidden plaques to read, several short videos to watch. There was plenty to keep Annelise interested while we made our way through. 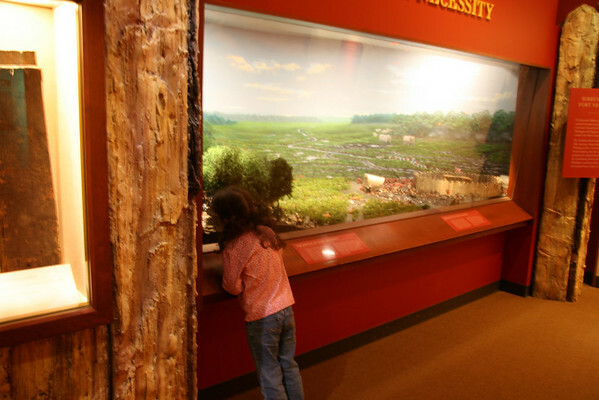 Annelise was fascinated by this French Indian War display, she kept wandering back to it when she wasn't looking at the natural woods/wildlife exhibit (where in attendance was a hooting owl and a chattering squirrel). She also stared at General Washington's sword for a LONG time and pushed every button and lifted every flap that she could. Our favorite films were about George and Martha's 40 year marriage, how spies played a part in the American Revolution, and an almost Imax style experience where you felt the cannon fire and it even snowed inside the auditorium. I know! By far the highlight of the museum for Annelise was the Hands On History area. This was perfect for young children. 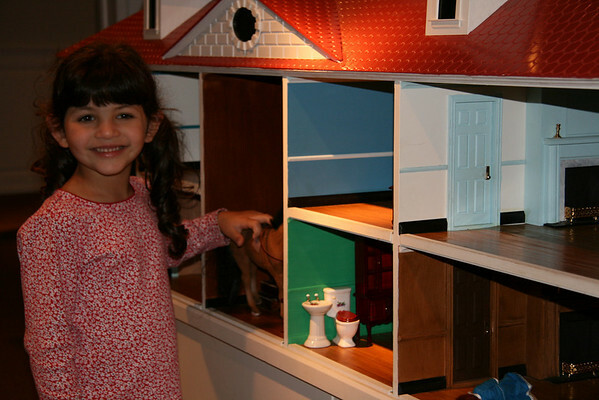 There were several activities to choose from like playing with a doll house version of Mount Vernon. Needless to say this was a hit. Besides playing with Colonial period toys, playing with puppets and an interactive farm animal exhibit, you could play Colonial dress up. I know! Pretend you were George and Martha. There were also puzzles, magnetic dress up dolls, tea sets and much more. This room was incredible! Bless that Ladies' Association to pieces. 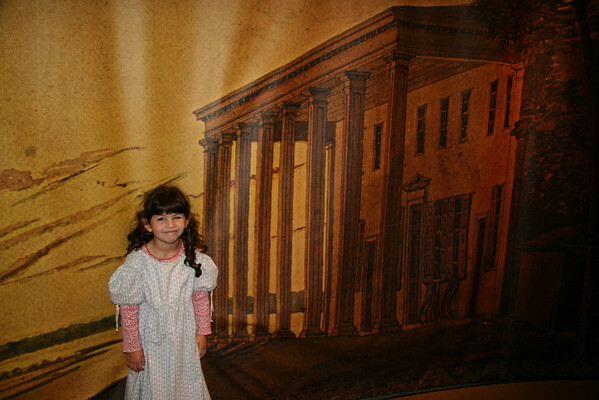 Annelise thoroughly enjoyed her museum experience and took away some tidbits of knowledge about George Washington. This warmed my heart. So did seeing her gallop around the grounds. 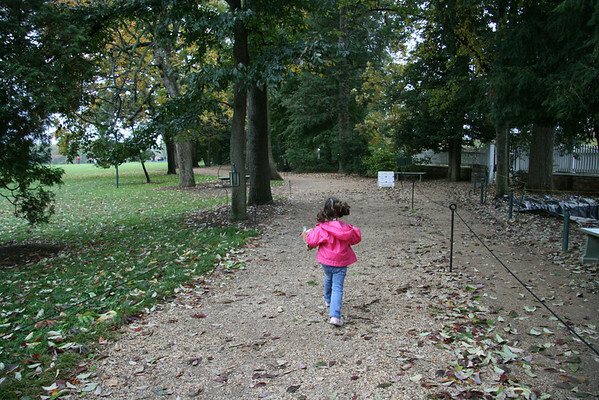 We ended up spending almost all afternoon at Mount Vernon and had a wonderful time. Truly. Now I am inspired to learn more about our Founding Fathers and our nation's early history. If you have an opportunity to visit, do not hesitate. They have made so many impressive educational improvements to make your visit more meaningful and memorable. If you do go, make sure you give me a ring, I might just want to join you. What a beautiful trip! Looks like wonderful memories were made...I really have always wanted to visit the center of the history of our country. I will wait till the kiddo gets a little older. Oh, I highly recommend a trip to DC with your children. Our daughter is five, so she picked up on some things and of course was bored by others. We want to go again when she is 10 or 11. I'd really like to go just with adults to spend more time in the museums without whining. The French & Indian display reminds me of Night at the Museum. You have the PRETTIEST eyes, Holly! oh, I've always wanted to go to Mt Vernon but we never have. the museum looks like a great addition! 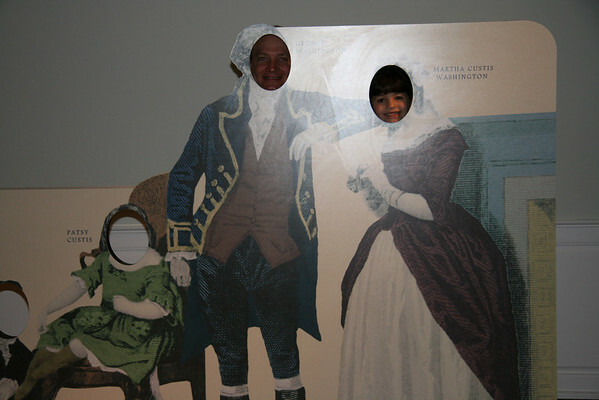 when we went to Williamsburg, my son and daughter did the dress up/play area there. my daughter was five then and still remembers that part of the trip!